Sharing the holiday season with friends and family is my favorite part. I love creating different recipes to share with friends either at one of the many events we attend or as a special touch to a gift. One of my go to kid snacks now has seasonal flavors and I couldn't be more excited. 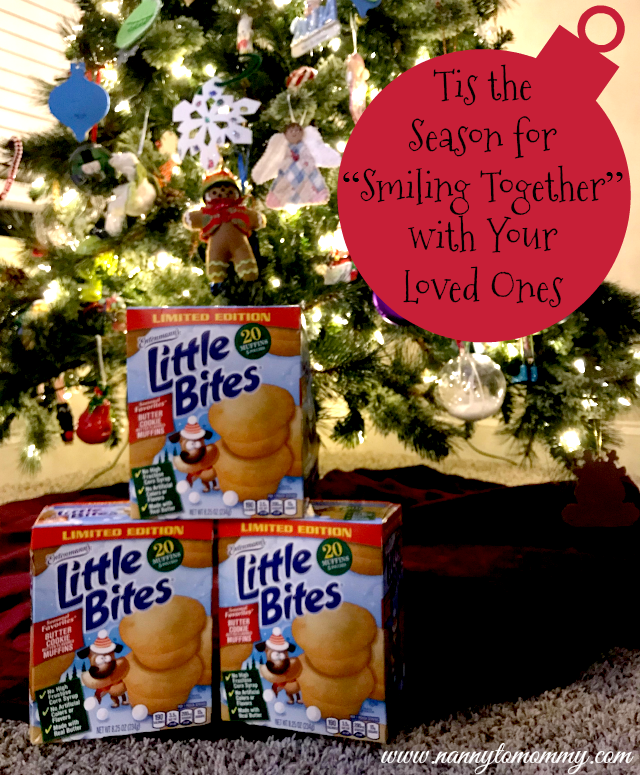 We love Entenmann's Little Bites! 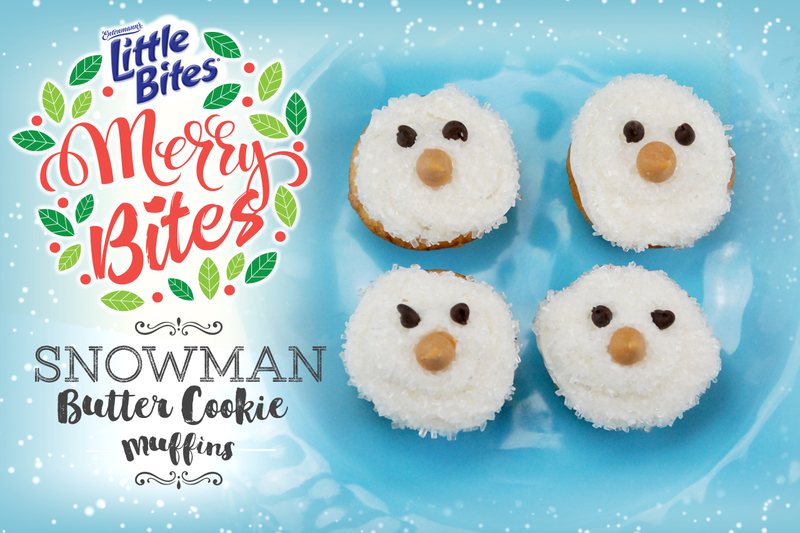 <3 Spread happiness and cheer with Entenmann’s® Little Bites® Butter Cookie Muffins! Part of the Little Bites® Seasonal Favorites® line, these buttery delicious mini muffins are perfect for festive get-togethers and scrumptious snacking anytime. Using Real Ingredients, Little Bites have Zero (0) Grams of Trans Fat Per Serving and Contain NO High Fructose Corn Syrup. Check out this super easy recipe below to make your get-togethers more festive. 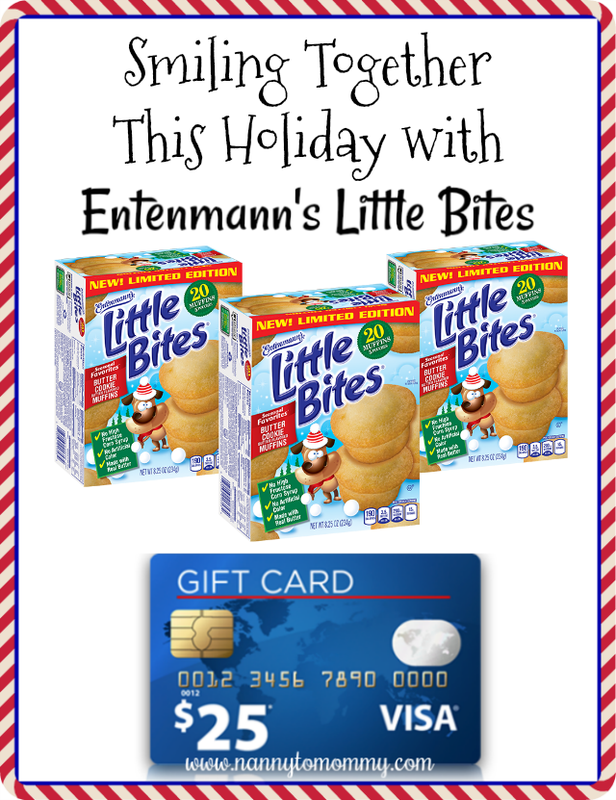 One lucky Nanny to Mommy reader will win a $25 VISA E-gift card and 3 $5 off Entenmann's Little Bites coupons! Entry is simple, just follow the prompts on the Rafflecopter below. Open US only, must be 18+ to enter. Winner chosen via Random.org through Rafflecopter. All winning entries are verified. Please follow us on Facebook to stay up to date with our current giveaways. Good luck! I received complimentary products from Entenmann's to provide this review and giveaway. All opinions are my own. This product was featured in our Holiday Gift Guide, if you would like to see your product featured for this or another Gift Guide - feel free to contact us. Nanny to Mommy is not held responsible for sponsors who fail to fulfill their prize obligations. This contest will run through December 12, 2017 at 11:59 EST. No purchase necessary. US entries only. Must be 18 years or older to win. This promotion is in no way sponsored, endorsed, or administered by or associated with, Facebook. You understand that you are providing your information to Nanny to Mommy and not to Facebook. We have represented each sponsor with the expectation they will fulfill their prize in a timely manner. We will contact the sponsor regarding your prize(s). The sponsors, in most cases, are shipping their items to you directly. I will make every effort to assist you obtaining your prize. If there is an issue with a sponsor, please notify the blog you won a prize from within 4-6 weeks for assistance, after that we may be unable to assist you. I really like the blueberry little bites. Mostly I like them because they're a great snack and super convenient. I like the blueberry flavor. These are perfect snacks for the kids. We love little bites because they are always fresh and easy on the go. Our overall favorite is the Snickerdoodle ones but they are seasonal. Then the pumpkin which is also seasonal. We can not wait to try the butter ones. Blueberry muffin is my favorite Little Bites . I like Little Bites because they come portion controlled pouches. They are also easy to transport and just toss in a desk drawer to eat later. My favorite is the crumb cake variety. My kids love the Strawberry the best! I love the brownie bites! They make a quick snack! My favorite Little Bites flavor is blueberry! Ooh I really LOVE the brownie bites!! Yummo!! I like the brownie bites best! I like Little Bites because they are an easy snack to grab on the go. I really love the blueberry muffins Little Bites. They are the perfect size to have with a small cup of milk. The Little Bites are a really easy & quick snack. I love little bites because they're delicious and moist. My favorite flavor is the chocolate chip little bites. We like the blueberry flavor! Hmm, I really like Snickerdoodle flavor Little Bites, and my nephews love the brownie Little Bites. We eat these a lot, lol. our family loves the blueberry flavor. My little girl loves Little Bites. They are so easy for her to eat. We like the fudge brownies the best. We love them! Little Bites are fresh, small, convenient, full of your favorite flavors cakes. We love them! I love the crumb cakes! We love the Chocolate Chip Flavor Little Bites. Perfect size for snacks for my grandsons. We love Little Bites. Our favorite flavor is Chocolate Chips but we also like to try the seasonal ones. My favorite is the Entenmann's Little Bites Blueberry Muffins! Soooo good! I always look forward to the seasonal products that Entenmann's puts out. But I do love the blueberry muffins year round. My favorite are the Brownie Bites! I like that you can keep popping them endlessly (well I can anyway)! I like the blueberry bites. I love that they are small and can go with you to work, school, trips, etc. We love the Chocolate Chip Flavor Little Bites. They are great for snacks and to pack into my kids lunchbox for school. The brownie bites are my favorite. Just the right amount for a snack. Blueberry. Reminds me of when do was a kid. I really tried to like the chocolate chip but it just was not for me. I like the blueberry flavored ones. I like them because they are easy to take on the go. I have personally never tried Little Bites but if I did I would probably like blueberry flavor. My family enjoys the brownie bites flavor or the seasonal flavors and I like them because they are convenient to take for a snack at work or school. My favorite flavor is the fudge brownies. I'm a fan of the banana muffins. They're a sweet treat. My favorite flavor is the blueberry muffins.